JERUSALEM (AP) — The United States opened its new embassy in Jerusalem Monday with a high-powered American presidential delegation joining Israel’s top leadership in a celebration of their countries’ friendship and the city’s history as the ancient capital of the Jewish people. 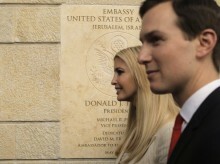 About 800 well-dressed guests packed a podium outside the former U.S. Consulate compound in southeastern Jerusalem that was rededicated as the new embassy, for the time being until a permanent site is determined. Guests were handed red and blue baseball caps marking the occasion, the U.S. Marines presented their colors and a large video screen featured the American flag and a montage of Israeli and U.S. leaders meeting throughout the years. For Israelis, it marked the first official recognition of their capital after 70 years. But the move infuriated Palestinians, who seek the eastern part of the city that Israel captured in the 1967 Mideast war as their future capital. Also absent were the ambassadors of many European nations that opposed the move, adhering to the stance that embassies should stay in Tel Aviv until Jerusalem’s final status is resolved. The gala gathering came in the shadow of the deadliest day of violence along the Israel-Gaza border since the 2014 war, where Israeli soldiers shot and killed more than 50 Palestinians during mass protests. The American delegation was led by Deputy Secretary of State John Sullivan and included Treasury Secretary Steven Mnuchin, four Republican senators, Kushner and Trump’s daughter and senior adviser Ivanka. But it was all about Trump, whose video address drew the largest cheers and chants of “Trump, Trump, Trump.” The square at the entrance to the new embassy was named United States Square — in his honor — and large billboards lined the route there thanking Trump for “making Israel great.” Some guests were even spotted wearing “Make American Great Again” hats. Nearly every speaker singled out the president with praise for upending decades of U.S. policy and fulfilling one of his key campaign promises of recognizing Jerusalem as Israel’s capital and moving the American embassy there from Tel Aviv. Most compared it favorably with President Harry Truman’s decision to recognize Israel after it declared independence in 1948. Of all the dignitaries, Kushner and Ivanka attracted the most attention. Their arrival to Israel was widely reported in the local media and both played a part in the embassy’s opening ceremony. Ivanka, in an off-white outfit, unveiled the embassy seal and dedication plaque while her husband delivered one of the keynote addresses. As significant as the event was for many Jews, it appeared to be equally important for Israel’s Christian allies. The invitation-only audience seemed to have as many Christians as Jews, and prominent evangelical Christian allies took part in the ceremony. Pastor Robert Jeffress, leader of a Dallas-area Baptist church and a spiritual adviser to Trump, delivered the opening blessing, and Pastor John Hagee gave the closing blessing. Jeffress told The Associated Press before the blessing that some of the things attributed to him have been taken out of context. The evangelical embrace has drawn criticism from some quarters, especially liberal American Jews who oppose the conservative Christian agenda. Evangelicals say their affinity stems from Christianity’s Jewish roots, and some view Israel’s establishment as fulfilling biblical prophecy.